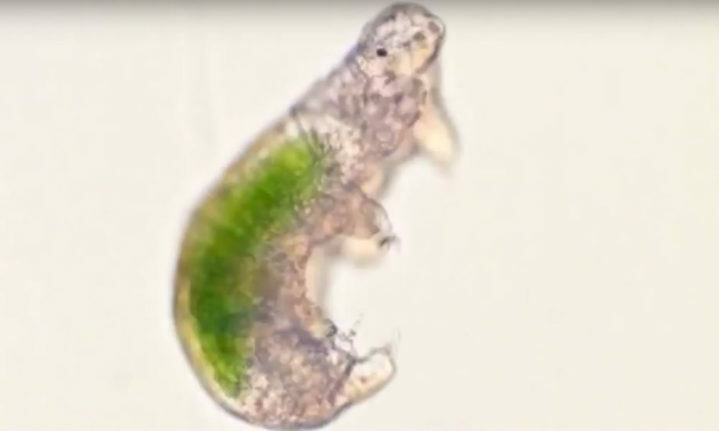 A Tardigrade with Chlorella sp. inside its stomach. After having been frozen for more than 30 years, three Tardigrades have successfully been revived by researchers from the National Institute of Polar Research in Japan. Tardigrades, also known as water bears, are water-dwelling mico-animals that live in various parts of the world – from the Himalayas to deep ocean trenches. Scientists have found Tardigrades are tough little creatures: they’re able to withstand temperatures as low as 1 Kelvin (-272° C) and as high as 420 K (150° C). Because of their hardiness the European Space Agency sent Tardigrades into space with the orbital Foton-M3 mission. There they were exposed to the vacuum of space to see how these hardy creatures would fare in the harsh environment of space. The Tardigrades not only survived this trip, but some even reproduced when they arrived back on Earth. This time around, two Tardigrades and a Tardigrade egg that were frozen with a moss sample collected on 6 November 1983 during the 24th Japanese Antarctic Research Expedition were thawed for 24 hours on 7 May 2014. Named Sleeping Beauty 1 and 2 (SB-1 and SB-2) for the study, the Tardigrades were rehydrated after thawing and both revived successfully. SB-1 was revived and successfully laid eggs, while SB-2 died without ovipositing. The third Tardigrade, named SB-3, hatched from the egg frozen with the sample and also eventually laid eggs. Although the first eggs layed took longer to hatch than later batches, all the newborns were completely healthy. The revival of the Tardigrades was to study the characteristics of cryptobiosis in micro-animals. Cryptobiosis is a metabolic state organisms can enter when their environment experiences adverse conditions, such as oxygen deficiency. Watch the video compiled by the SciShow below to find out just how tough water bears are.